Heat oven to 350 degrees. Prepare puff pastry shells according to package directions. In skillet, cook and crumble turkey sausage as specified on the package. Always cook to well-done, 165 degrees, as measured by a meat thermometer. Remove from skillet. In same skillet, pour eggs. Cook until softly scrambled, stir in half the cheese. 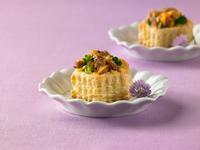 Fill each puff pastry shell with cooked sausage, broccoli and scrambled eggs. Sprinkle with remaining cheese. Place on baking sheet. Bake 10 minutes or until hot. Sprinkle with fresh chives, if desired.